The reimagined Union Market is a hipster oasis amidst otherwise gloomy, industrial surroundings. If you haven’t made the trip to NE, now’s the time. BTM recommends making a morning of it by renting bikes from Capital Bikeshare and heading over for a feast, corn hole and some outdoor adult beverages. Though the outside of Union Market resembles a Home Depot with its white and orange color scheme, the inside is polished, vast and has a very Brooklyn vibe. Developers imagine a day when the surrounding area will feature “a vibrant mix of retail, restaurants, hotel, entertainment, incubator space for new food concepts,” and more. 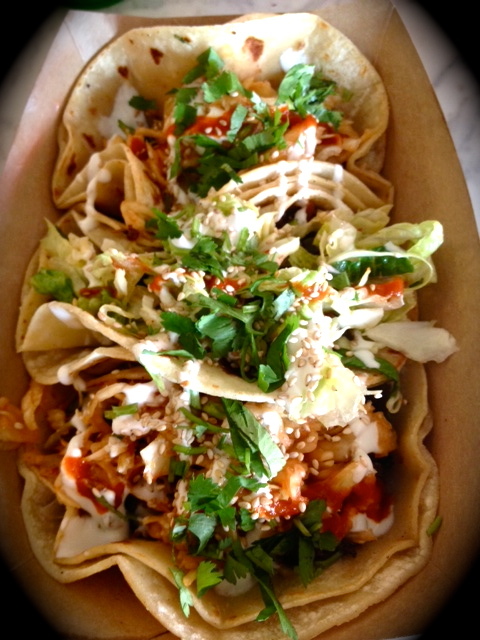 The Best Thing at the Market: TaKorean Bulgogi Beef Tacos pack in the flavor, fusion and fun. Korean BBQ tacos have finally made their way east after many successful decades on the West Coast. DC native Mike Lenard’s TaKorean opened its food truck windows back in 2010. They offer bulgogi beef, tangy chicken and caramelized tofu tacos with two kinds of slaw, cool lime crème, sriracha, fresh cilantro and sesame seeds on corn tortillas. Their tortillas are impossibly warm and fresh, which propelled TaKorean past other contenders for Best Thing at the Market accolades. TaKorean’s popularity prompted them to open a non-mobile shop out of Union Market. Several other food trucks have also set up shop at the market, allowing them to expand their offerings and bring in some cash over the weekend when food trucks would otherwise be dormant. You can mix and match tacos and toppings for a great meal on the go or at the market. Also available at Union Market – Buffalo and Bergen, Curbside Cupcakes, DC Empanadas, Red Apron Butchery, Righteous Cheese and more. Bulgogi Beef Tacos not your Best Thing at the Market? Post your favorites in the comments section.